Spelling - Show Me WOW! Phonics are very important in a spelling programme and no one disputes this, but they are only part of the strategy. And teachers must use the soft phonic sounds, so that the words blend easily, not the hard phonic sounds used long ago, when there were huge classes and a soft phonic sound would not have been heard by the children at the back of the classroom! No wonder some of them took so long to learn to blend and read. I do know that there are still teachers in many areas who try to “help” their your readers and spellers by presenting them with hard phonic sounds and I wish they would realise that there is an easier way! Sight words are important too because, unfortunately, if you want to spell English words correctly, you cannot rely solely on phonics! You have to have easy access to a hard copy of the correct spelling, clearly written with a correct balance of letter sizes. Then the visual memory part of brain can start to “photograph the correct spelling and store it. You know yourself that if you are hesitant about a particular spelling, you look sideways, or close your eyes for a moment in order to bring the visual memory of that spelling back into your mind’s eye. Or you might write down several possible spelling options of the word and then your visual memory picture of it recognises the correct spelling . Or maybe , in a hurry to get your writing done, you do what most children do and substitute the word you really wanted to use for a word that is easier to spell! access to the word neatly written. (oh those teachers who left it up to children to guess the spelling and then spend hours and hours of their lives scratching a red line through every mis spelling and scribbling a few illegible letters above an error are not only wasting their own time but are also demoralising the child’s efforts.What good did that do for anyone? I am not saying do not correct spelling errors, but I am saying do this is a positive way rather than a taking-their-confidence-away way. And better still, by giving them easy access to the spelling in the first place, you are preventing learners making mistakes from the start and encouraging them to add correct spellings to their visual memory..much better for everyone don’t you think? pictures by the word, finding words in the word, making up mnemonics using rhythmic chants. adopting a kinaesthetic angle, all these can help the brain create that visual memory. spelling tests of words that are already in the room. This would be a class lesson, where the learners are allowed to get out of their desks to find the word, but must not stand too long by it or others will know where it is! 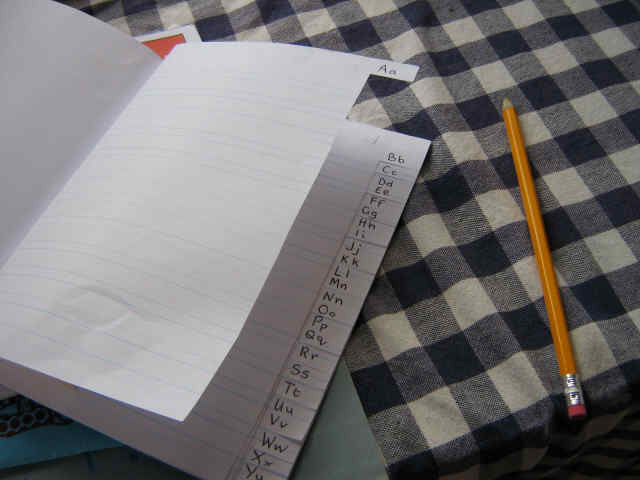 The learner tries to “photograph” the word in his memory and then returns to his desk to write it in his book. He must not take his book with him to copy. He has to copy from his memory, even if it means he visits the hard copy of the word several times. Children who have “Spelling Round the Room” tests often try to jump ahead and read the walls regularly to be sure to know where these words are for when they need them. They have the memory of this position ready in their visual memory, not only for “Spelling Round the Room” tests but also for when they need the word for any other writing they do. You could even get the learners to take turns to make up the list for the “Spelling Round the Room” test. You will be surprised at how hard some of the words are that they love to include in their list. So they are improving reading as well as spelling. don’t tell learners to learn their spellings , before you have taught them how to learn them! don’t say “Look it up in a dictionary” especially if they are mid stream in a piece of creative writing. You have to be a nearly right speller of the particular word anyway, in order to use a dictionary quickly and efficiently. don’t call out the letters in response to a request of “How do you spell…please?” This only tests your spelling. It is not an efficient way of teaching your learner to spell! don’t expect them to rely solely on a spell checker. They are not always that reliable. For example, the following passes the spell checker test! I hope it makes you smile! It’s letter perfect awl the weigh, my cheque a tolled me sew! a bear drawn by the word “bear” and a shivering man drawn by the word “bare” would work. (Maybe though, as bare man does not shiver in a warm climate, another picture will have to do! “There” needs a signpost drawn round it and draw a flower growing at the base of the signpost. The word “there” signifies a place, hence the sign post. “Their” drawn with a house, a sock, a T shirt drawn beside the word “their” pointing out the letter “i” in the word and explaining that these things belong to the owner so the owner can say “I have a house” “I have socks! “I have a T shirt”, so this is the “their” with “i” in it. Because= (take the first letter of each of the following words) big elephants can always upset small elephants. never eat caviar, eat smoked salmon and remain yuppy. I look forward to hearing of your mnemonics to add to my collection! Children love stories! (Well don’t we all?) So why not use this to your advantage to help teach children how to spell? For example, and you can add flourishes to this, try this story to teach how to spell the word “friend”. On Monday a child asks the parent if a friend can be invited round after school. The parent says “No, you have homework this evening and school tomorrow!” This question is asked day after day with the same response for the parent. By Thursday the child asks that same question. This time, the parent says, “Yes you may have a friend round as tomorrow is Friday and it’s the end of the week..i.e. fri…end spells friend. This is another difficult word that has an important place in helping learners to learn how to spell. The very act of writing clearly and in a non hurried way can help learners acquire the visual image of how a word looks. It’s as if a message goes down the fingers and via the arms to the brain!